The St. Catherine of Siena program at Queen of Peace High School is an intense, immersive three year experience where select high achieving students are invited to start independent research on a STEM (Science, Technology, Engineering and Mathematics) topic of their own interest. Each student is assigned a mentor who is an expert in their chosen topic. 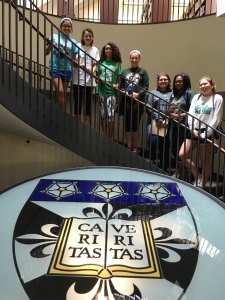 Recently, the St. Catherine of Siena candidates visited Dominican University to work with academic librarian, Ning Zou, on digital research strategies. 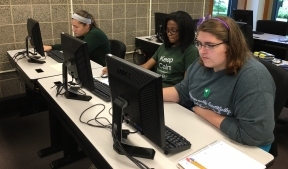 Students learned how to use databases and other tech-based sources to enhance their projects. During the program first year candidates determine their research topic. Second year candidates refine their topic and continue to find research in support of their project. 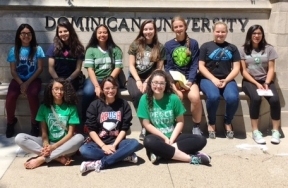 The culmination of the program in the third year involves students defending their research to the St. Catherine of Siena Congress.